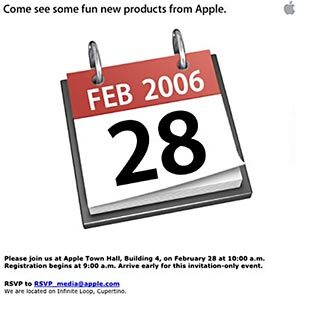 A reminder that in an email sent last week to media outlets, Apple invited the media to visit Apple’s Cupertino, Calif., headquarters, Apple Town Hall, Building 4 at 10am PST/1pm EST next Tuesday, February 28 to “Come see some fun new products from Apple.” The invitation (shown at left) includes nothing more than an iCal image of a calendar with the date Feb. 28. • iMac and MacBook Pro owners: Apple USB Modem. Easily connect to the Internet using dial-up service. Only $49. Lay them in the aisles Apple. WHAT? WHY WASN’T I INFORMED??? Here;s why i think the earnings will be a huge dissapointment. #2: ValueClick does not have a search engine or anything as such to increase traffic. #4: Value click is currently valued at 1.86 billion. Google is 100bill which is like a 6:1 ratio, is ValueClick worth 1/6th of Google, probably not, especially since google is not worth 1/1 of its own value. All these clues tell me 1 thing. If you own this stock you should not be holding it, it is headed straight down 10-20% after the earnings report. It can also have a gravity effect on other stocks such as Google and Answers.Com and etc.. If they announce a $999 13-in iBook, I will definitely scoop one of those up tomorrow. Despite the unlikeliness of getting intel ibooks tomorrow, I still think that if they did announce them, that would kick more @ss than imaginable. I’d be trying to buy one, like, while they were giving the announcement. MW: shitting. as in, I’m shitting my pants with excitment. i think that is what it will be. a 10 inch screen ipod. You don’t put $360 CPU’s in under $1,000 computers. In bulk quantities, Intel is selling the Core Duo chip for an estimated $360. Apple tries (and usually succeeds) to maintain a 25-30% margin on its products. A $360 chip and a $300 profit on a $1,000 computer leaves $340 for everything else- Superdrive, memory, graphics card, sound card, display, networking, keyboard, etc. A high quality LCD costs more than $340 as a replacement part. Its a big deal. I’ll be there. That’s how you know its a big deal. Why? Because I’m Denny Crane. Re-Ality: My thoughts exactly. I foresee an Intel Core Solo and a $1199 price point as more realistic.